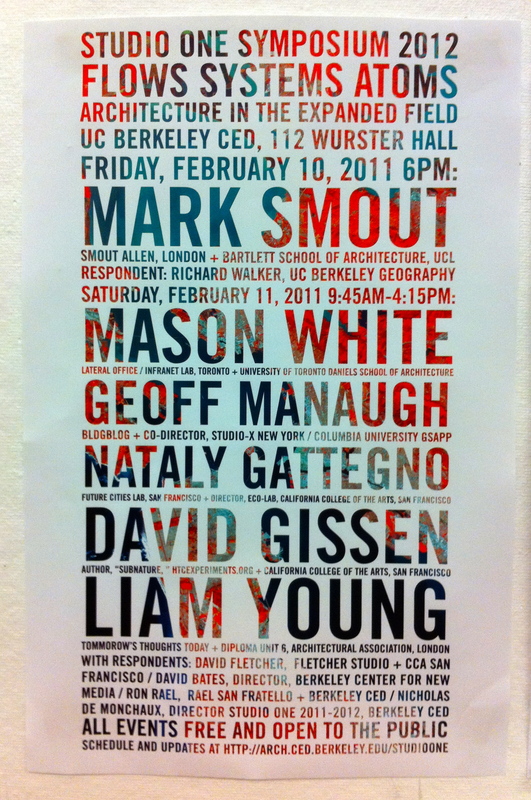 Mark Smout [Smout+Allen], Mason White [Lateral Office] and Geoff Manaugh [BLDGBLOG] as well as our own CCA professors, Natatly Gattengo (thesis advisor) and David Gissen will be presenting this week [Friday+Saturday, Feb.10+11] at UC Berkeley’s Studio One Symposium 2012. The symposium will focus on the studio’s themes of architectural agency at an ecological and infrastrucutral scale, a topic extremely relevant to my current thesis trajectory. Very excited!